Antineutrinos are the antiparticles of neutrinos. 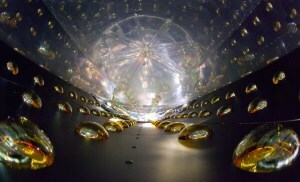 The antineutrino is an elementary subatomic particle with infinitesimal mass (less than 0.3eV..?) and with no electric charge. Neutrinos and antineutrinos belong to the family of leptons, which means they do not interact via strong nuclear force. Neutrinos are gravitational and weakly interacting subatomic particles with ½ unit of spin. 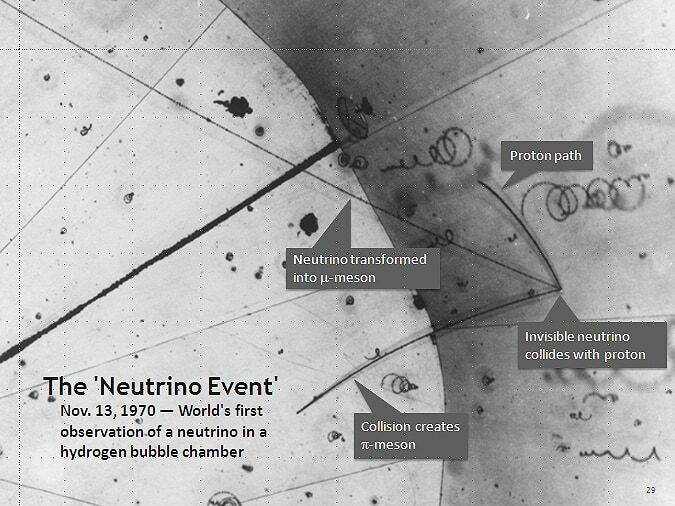 Also antineutrinos (as neutrinos) are very penetrating subatomic particles, capable of passing through Earth without any interaction. 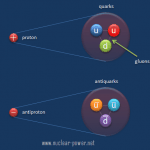 Currently (2015), it is not resolved, whether the neutrino and its antiparticle are not identical particles. Antineutrinos are produced in the negative beta decay. 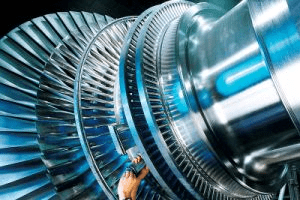 In a nuclear reactor occurs especially the β− decay, because the common feature of the fission products is an excess of neutrons (see Nuclear Stability). 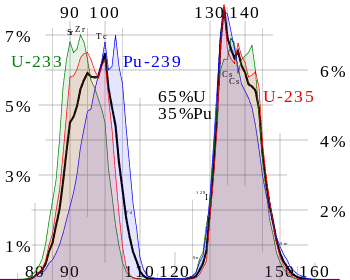 An unstable fission fragment with the excess of neutrons undergoes β− decay, where the neutron is converted into a proton, an electron, and an electron antineutrino. 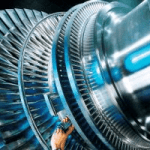 Therefore each nuclear reactor is very powerful source of antineutrinos and researchers around the world investigate the possibilities of using antineutrinos for reactor monitoring. On the other hand the most powerful source of neutrinos in the solar system is doubtless the Sun itself. Billions of solar neutrinos per second pass (mostly without any interaction) through every square centimeter (~6 x 1010 cm-2s-1) on the Earth’s surface. In the Sun, neutrinos are produced after fusion reaction of two protons during positive beta decay of helium-2 nucleus. 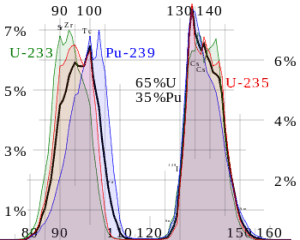 This interaction is symmetrical to the beta decay of free neutron, therefore it sometimes referred to as inverse beta decay. 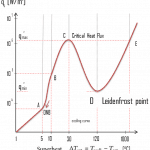 All detection methods require the neutrinos to carry a minimum threshold energy of 1.8 MeV. 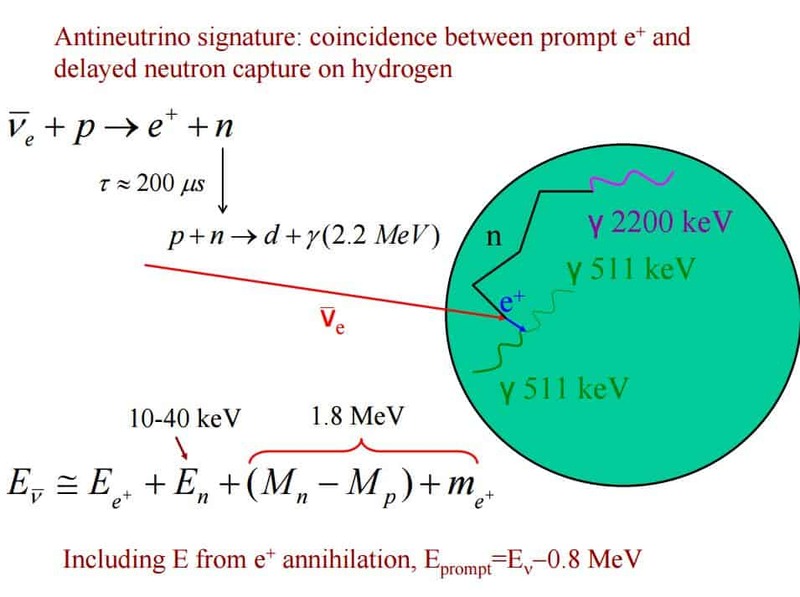 Only antineutrinos with an energy above the threshold of 1.8 MeV can cause interactions with the protons in the water, producing positrons and neutrons. Nuclear reactors are the major source of human-generated antineutrinos. This is due to the fact that antineutrinos are produced in a negative beta decay. 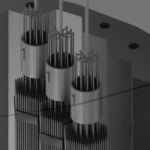 In a nuclear reactor occurs especially the β− decay, because the common feature of the fission fragments is an excess of neutrons (see Nuclear Stability). An unstable fission fragment with the excess of neutrons undergoes β− decay, where the neutron is converted into a proton, an electron, and an electron antineutrino. 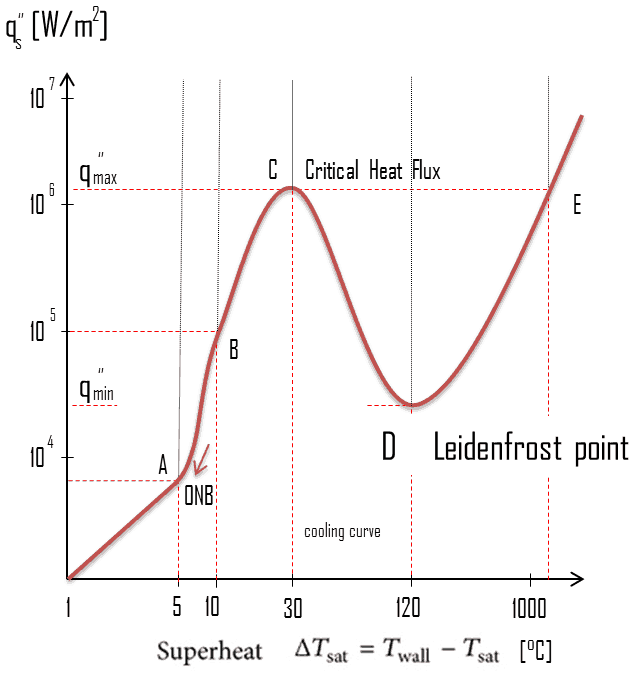 The existence of emission of antineutrinos and their very low cross-section for any interaction leads to very interesting phenomenon. Roughly about 5% (or about 12 MeV of 207 MeV) of released energy per one fission is radiated away from reactor in the form of antineutrinos. 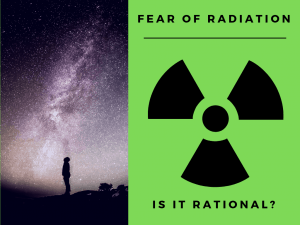 For a typical nuclear reactor with a thermal power of 3000 MWth (~1000MWe of electrical power), the total power produced is in fact higher, approximately 3150 MW, of which 150 MW is radiated away into space as antineutrino radiation. This amount of energy is forever lost, since antineutrinos are able to penetrate all reactor materials without any interaction. 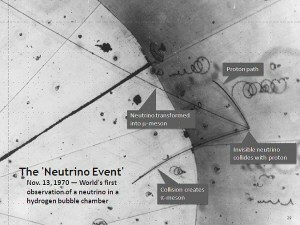 In fact, a common statement in physics texts is that the mean free path of a neutrino is approximately a light-year of lead. Moreover, a neutrino of moderate energy can easily penetrate a thousand light-years of lead (according to the J. B. Griffiths). Please note that billions of solar neutrinos per second pass (mostly without any interaction) through every square centimeter (~6×1010) on the Earth’s surface and antineutrino radiation is by no means dangerous.
. These nuclei have together 98 protons and 136 neutrons, while fission fragments (parent nuclei) have together 92 protons and 142 neutrons. 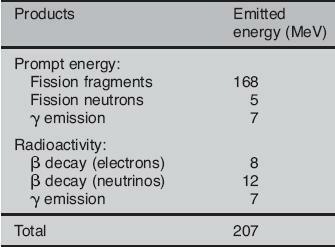 This means after each U-235 fission the fission fragments must undergo on average 6 negative beta decays (6 neutrons must decay to 6 protons) and therefore 6 antineutrinos must be produced per each fission. 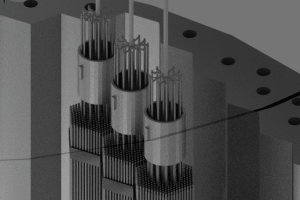 The typical nuclear reactor therefore produces approximately 6 x 1020 antineutrinos per second (~200 MeV/fission; ~6 antineutrinos/fission; 3000 MWth; 9.375 x 1019 fissions/sec). Reference: Griffiths, David, Introduction to Elementary Particles, Wiley, 1987. The inside of a cylindrical antineutrino detector before being filled with clear liquid scintillator, which reveals antineutrino interactions by the very faint flashes of light they emit. Sensitive photomultiplier tubes line the detector walls, ready to amplify and record the telltale flashes.